I spent 3 days walking around the Gen Con floor in Indianapolis, Indiana this past weekend. Gen Con is the largest game convention in North America. There were over 60,000 unique attendees at Gen Con this year. I play-tested dozens of new Trading Card Games (TCG) and Board Games over the weekend. 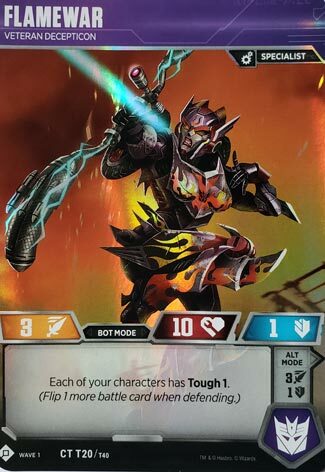 One of the more popular new games at Gen Con this year was the new Transformers Trading Card Game by Wizards of the Coast. 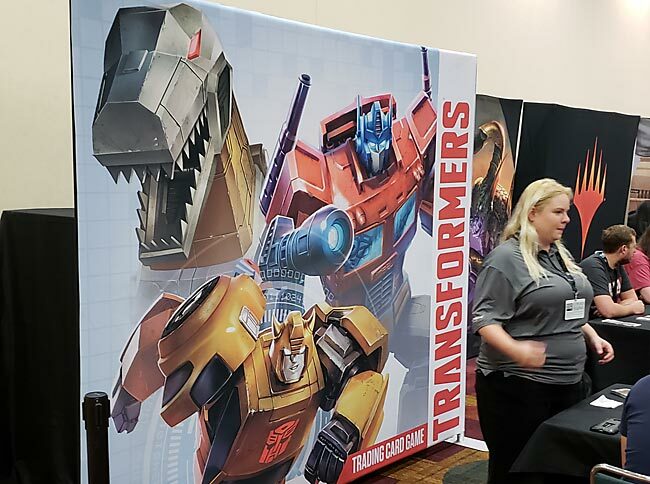 The game will officially release in late September, but Wizards of the Coast put a limited amount of Transformers TCG 2-Player Starter Sets up for sale every morning of the Con. The line for purchasing Starters every morning was very long … going well across the main gaming hall. Lucky Transformers’ Fans were able to get their hands on one. 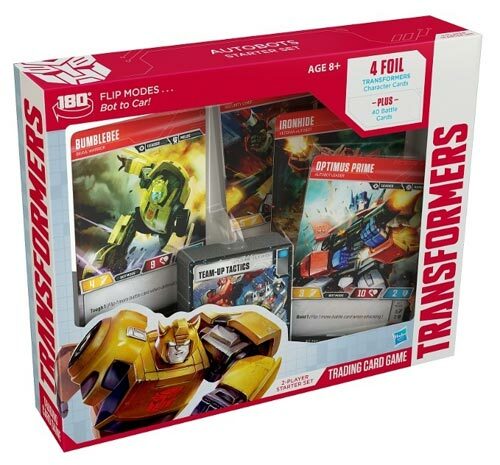 The Transformers 2-Player Starter Sets contain 4 Foil Transformer Character Cards (Optimus Prime, Bumblebee, Ironhide and Red Alert), and 40 Battle Cards. Wizards of the Coast also had a small demo area where you could demo the Transformers TCG. 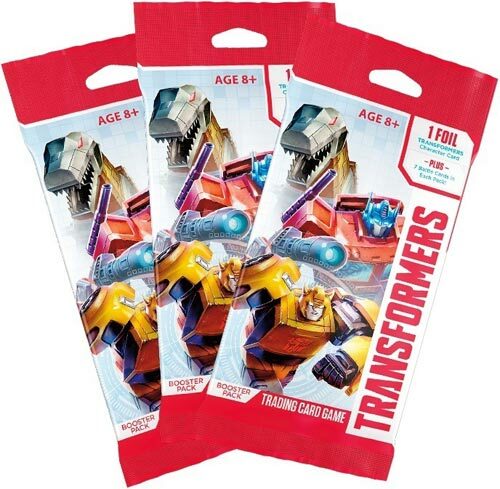 If you took the demo, you were rewarded with a Transformers Character Trading Card. 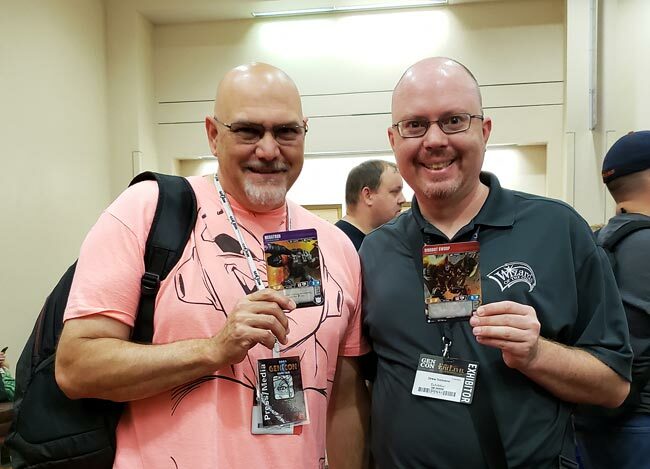 I sat down with Drew Nolosco (Brand Manager – Transformers Trading Card Game at Wizards of the Coast) for about 45 minutes. We discussed the Transformers game in as much detail as we could during that time. 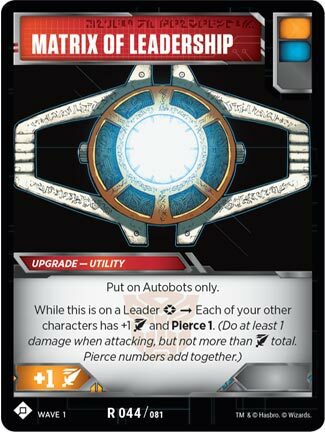 How do you play the Transformers TCG? Character Cards are large playing cards (3.5″ x 5.0″). They are same size as “Commander Cards” in Magic: the Gathering. 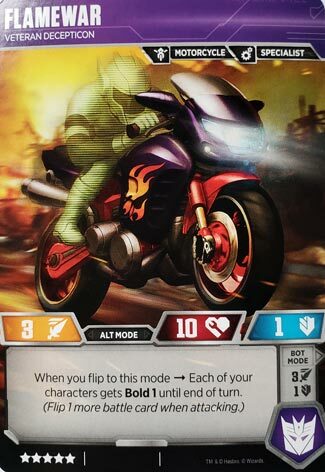 Players make a team of Transformers Characters with a point value of 25 stars or less (Star values are noted on the bottom left of the cards). Decepticons and Autobots can actually be on the same team. Each Character card is two sided so that it can be flipped (converted) into different modes. The way I understand it from Drew, is that Character Cards are unique as long as the name under their title is different. 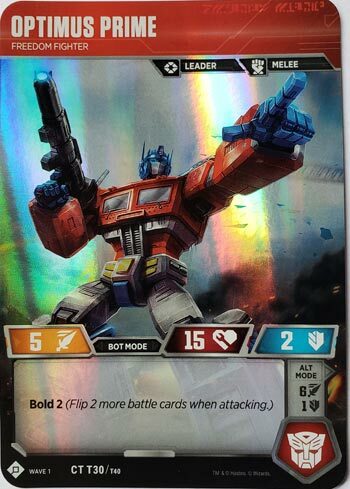 The card above is named “Optimus Prime – Freedom Fighter”. I have seen another Optimus Prime called “Optimus Prime – Autobot Leader“. Those two titles are unique, and you could actually have two Optimus Prime characters on your team. Attack / Health / Defense. If you look the cards above. Each character has an attack value (yellow), Health Value (Red) and Defense Value (blue). Health is the same, no matter which side of the card you are looking at. 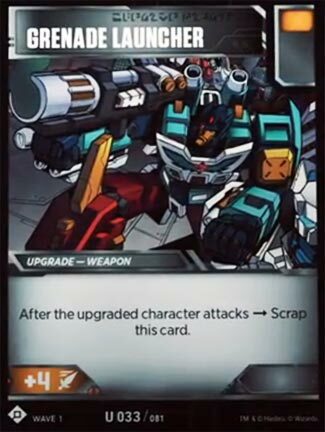 But the Robot side and Alt Mode side might have different Attack values and defense values depending on which side you using. There are 46 different Character Cards in this first installment of the TCG so far. You will also make a Battle Deck. Battle Decks are 40+ Battle cards. Battle Cards will give your characters Actions and Upgrade bonuses. Each character has slots for one Weapon Upgrade (like a Grenade Launcher) , one Armor Upgrade & one utility. These cards will always remain on the battlefield with your character. 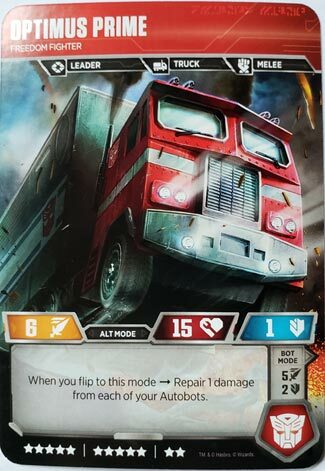 Battle Cards are also used to determine damage during Battles. This is roughly how the Transformers TCG is played as I understand it. Please note that this is my basic understanding of the rules. Wizards/Hasbro has a series of fantastic videos on their site showing this as well! Each player makes a Character Deck with a value 25 stars or less. So each player will start with like 2 to 5 Character cards. Each player brings along their Custom Made Battle Deck. At the beginning of the game, each player draws 3 battle cards. You also draw 1 Battle Card at the beginning of every turn. • Flip one character to another mode. (Once per turn you may flip/convert one of your characters). Don’t ask why, but Transformers don’t Transform in this game. TCG Trademark issue I think. • You may use an Upgrade Card. (Like a Grenade Launcher). Each character has slots for just one weapon upgrade, one Armor Upgrade & one utility. These will always remain on the battlefield. The player who goes first cannot upgrade a character on his first turn. You attack by “tapping” your card 90 degrees like in Magic the Gathering. If your opponent has any tapped characters you “must” attack one of them. Each player Flips over two cards in their battle decks on the table in front of them during the attacking/defending stage. You determine total Attack value by adding up the characters attack value, plus the number of Orange cards flipped. Notice how the Grenade Launcher above has an orange box in the upper left hand corner. You also add any bonus from upgrades and the Character’s Special Abilities. You determine total Defense value by adding up the characters attack value, plus the number of Blue cards flipped. You also add any bonus from upgrades and the Character’s Special Abilities. If everyone’s characters are tapped at the end of a turn, you untap all characters. Used Battle Cards are put into the Scrap Pile. I like this term for Transformers instead of the usual discard pile. Winning – If you eliminate all of the other players Characters Cards, you win the game. Each Booster Pack contains 7 Battle Cards and 1 Foil Character Card. I don’t know the rarity count yet, but I’ll work on that. I would guess it is something like: 1 rare, 2 uncommons and 4 commons. C – Common, U – Uncommon, R – Rare, S – Starter. ex. CT T20/T40 on Flamewar above indicates this card is a Common. My overall first impression is great. WOTC has totally eliminated mana and resources from games like Magic and Pokemon. The foil cards are beautiful and are on very nice card stock. The game seems easy to learn and easy to teach. It is designed for players aged 8 & Up, but Wizards of the Coast has assured me that there are plenty of deck building intricacies for the older crowd. I have not played any serious games yet. So I’ll have to give you more reviews as I get my hands on more cards. 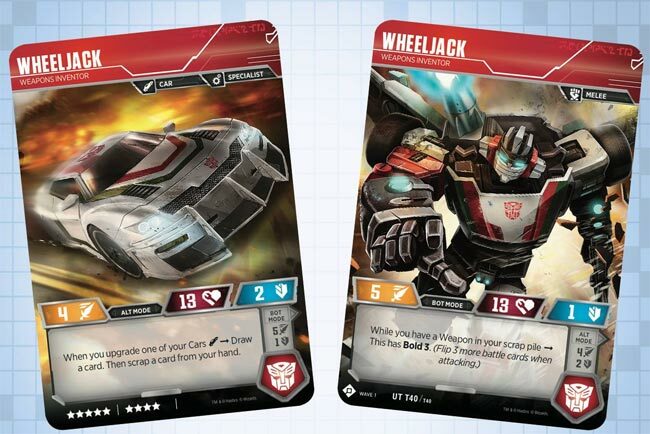 I think this game is worth playtesting and checking out if you are a Transformer fan and/or are looking for brand new TCG to get into.